Plants are eukaryotic, autotrophic organism with differentiation into stem, root and leaf. The branch of science that deals with the study of plants is called botany. Fungi (singular: fungus) are eukaryotic, heterotrophic organism without differentiated plant body. The branch of science that deals with the study of fungus is called mycology. Plants have definite cell wall. Fungi may be septate (with internal cross wall) or aseptate (without internal cross wall). Plant cell wall is made up of cellulose. Fungal cell wall is made up of chitin. Plant cell possess chloroplast therefore carrying out photosynthesis (autotrophs). Chloroplast is absent in fungal cells therefore living as saprophytes (feeding on dead decayed matter) or parasites (heterotrophs). In plant cells, phytosterols are associated with plasma membrane and membranes of other organelles. In fungal cells, ergosterol is the most common sterol associated with plasma membrane and membranes of other organelles. In plant cell, starch granules are present as stored food is starch. In fungal cells, glycogen granules are present as stored food is glycogen. Thanks, very useful. 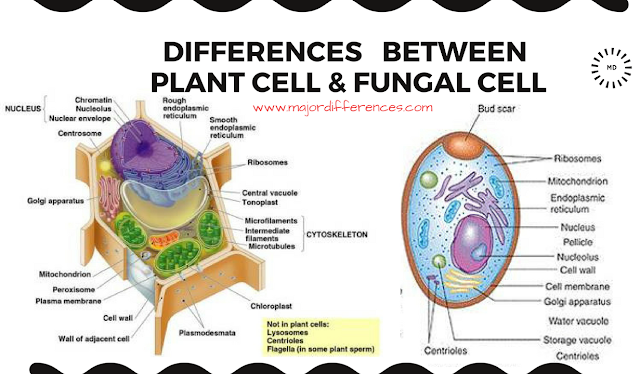 To add, fungal cells have centriole.